The Quarter Horse Inn is the pinnacle of Southwest Luxury. Located in scenic Williams, Arizona, be sure that there is no shortage of activities to keep you and your family busy on your vacation. Having four distinct and unique Flower themed rooms, you are sure to be delighted with elegant touches and thoughtful amenities that set each room apart from one another. Each room has its own full sized bathroom. With each room being able to be rented separately, you never know who you might meet while you stay! 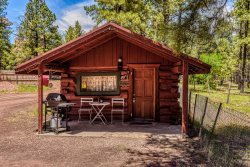 Set near I-40, this cozy, rustic log home is a 4-minute drive from a stop for the Grand Canyon Railways scenic tours, and a 1-hour drive from Grand Canyon National Park. The 4 woodsy rooms with en suite bathrooms are individually decorated with antiques, and feature flat-screen TVs with Blu-ray players (discs are available to borrow) and WiFi access. Most rooms have private entrances and claw-foot tubs. Some rooms have 2-person Jacuzzis and fireplaces. The wraparound porch has rocking chairs, and theres a living room with a fireplace. Its truly a feast for the eyes; come see it for yourself! Tucked at the base of the mountains in historic Williams, AZ, the Grand Living Lodge is a spacious, two-story Log Home with ample parking area in front. Relax in the restful, romantic atmosphere in one of our rooms. Every room is individually decorated with antiques and artwork pieces, private entrance (except for the Suite & Blue rooms located upstairs), wood floor, accent rugs, fireplace, ceiling fan, King or Queen-size bed with plush linens, sitting area with high back chairs, desk, luggage stand, HD Flatscreen TV with BluRay, Wireless Internet, private bathroom with Victorian claw foot tub with shower attached, pedestal sink, plush bathrobes, towels, toiletries, mirror, heat lamp, and hairdryer. From your home base at this home: Northern Arizona, ancient ruins, train ride to the Grand Canyon, golfing, rafting, helicopter rides, tours or horseback riding. We also offer accommodations for romantic getaways, business travelers, reunions, showers/weddings, and tea parties. Come and enjoy it all at the Grand Living Lodge. We have the comfort you deserve; see you soon!